This is an event worth celebrating! In the beauty queen tradition, it's a sash that is perfect for a new Mommy-to-be who wants everyone to know her wonderful news. Drape it across her shoulder during the baby shower for a cute conversation piece and great pictures. It can also be used at a family dinner to announce the pending arrival, or wear it to the office as a surprise announcement to co-workers. 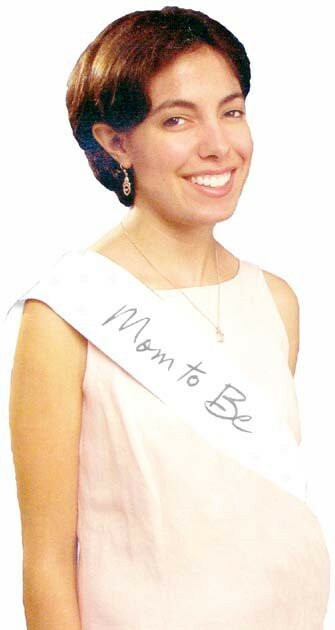 White plastic sash with pale green dots and the words "Mom to Be" written in a soft gray script with an adhesive strip on the edge for closure. Measures 66" x 4". And don't forget the Grandma to Be! Check out our "Future Grandma" Sash too.